Weather you want to give Mugs out to your customers, or just have personalised mugs in your office or hotel, these are a great tool for promotional and advertising purposes. These are also ideal for gifts with photos on them! We can also offer money boxes which can have any design on them using the same process. 1-off designs can be done, and the standard charge for these is £7.99 for Mugs, and £9.99 for the money banks, however bulk discounts are available. 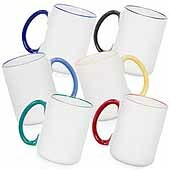 There are various of styles of mugs, but the most popular are the plain white 11oz mugs, or the 11oz mugs with coloured rims and handles as pictured on the left. 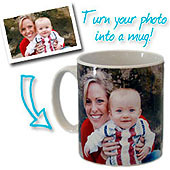 Both styles of mug are suitable for images, logos and text and have a large printable area around them. 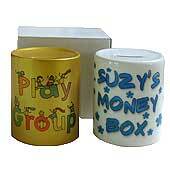 Money boxes are available in 2 colours, white and gold, but for best results we recommend the white version.